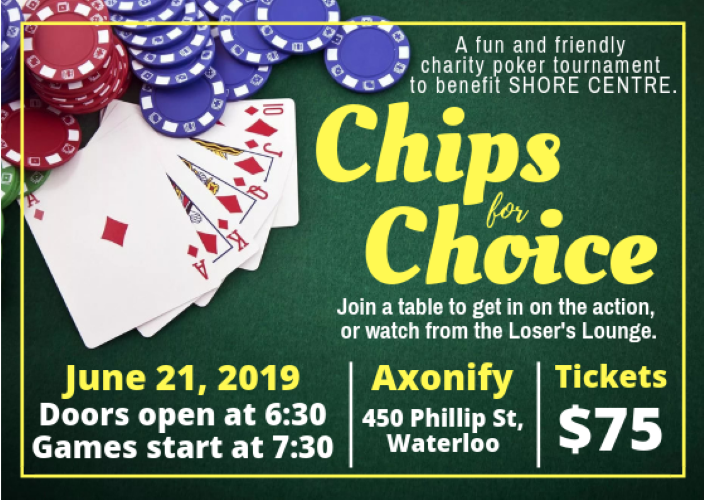 Your $75 event ticket for “Chips for Choice” will enter you into a friendly Texas Hold ‘em poker tournament, featuring a lesson for beginners and prizes for the final table. Plus, if you bust out we’ll let you re-buy in for $25 a time. No previous poker experience needed, we will have a guide at every table. If you’re not into poker, come hang out in the “Loser’s Lounge”, a great space to mingle, watch the action, enjoy refreshments and check out the raffle prizes. Thank you to Axonify Inc. and our generous event sponsors. Your ticket also includes wine/beer/soft drinks, delicious hors d’oeuvres and ample free parking. All event proceeds will be donated to SHORE Centre, Waterloo Region’s trusted source for accurate sexual health education and pro-choice pregnancy options support. SHORE Centre provides free programs for youth at risk, newcomers and adults with developmental disabilities to empower them to be part of healthy relationships and take care of their sexual health.